Without question the U.S. Navy is the most power nautical force in the world, combining state-of-the-art technology with unrivaled firepower. But the sea service has suffered a disturbing number of incidents involving four warships since January, leading some top-ranking officers and other experts to believe they may have been intentionally tampered with. 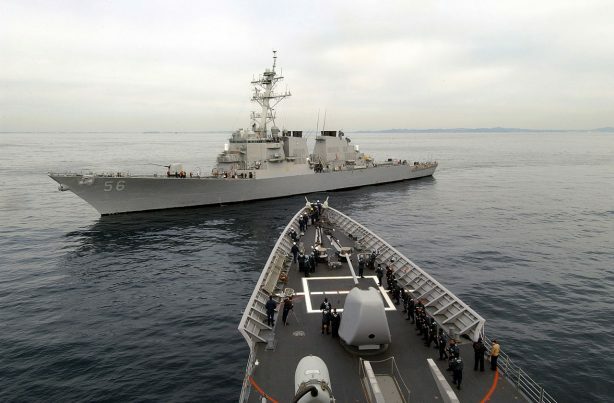 As reported by the Washington Free Beacon, Chief of Naval Operations Adm. John Richardson told reporters Monday following a collision between the USS John S. McCain, a guided-missile destroyer, and a commercial ship, that he could not rule out that the Navy vessel was targeted by a cyber attack. The U.S. 7th Fleet is based in Yokosuka, Japan. Part of the Pacific Fleet, it is the largest forward-deployed naval force consisting of between 60-70 warships, 300 aircraft, and 40,000 sailors and U.S. Marines. It is primarily responsible for maritime security and operations in and around the South China Sea, Indian Ocean, and waters near North Korea; losing ships to damage endangers the mission. The McCain collided with the Liberian-flagged oil tanker Alnic MC in the Straits of Malacca and Singapore late Sunday, injuring five sailors and leaving 10 sailors missing. The ship was on its way to Singapore where it docked after the collision. Photos show a deep gash in the ship’s hull. The latest collision was the fourth incident involving a 7th Fleet warship since January. As further reported by McClatchy DC, on Jan. 31 a guided missile cruiser, the USS Antietam, ran aground off Japan’s coast. Then, on May 9 another cruiser, the USS Lake Champlain, was hit by a South Korean fishing boat. And the Fitzgerald collided with a container ship on June 17. “I don’t have proof, but you have to wonder if there were electronic issues,” Jeff Stutzman, chief intelligence officer at Wapack Labs, a New Boston, New Hampshire, cyber intelligence service, told McClatchy. Some suspect China may be involved, though there is no evidence yet that is the case. The reason for that is because experts also suspect Russia of pulling off similar “spoofing” operations recently in the Black Sea. On 22 June, the US Maritime Administration filed a seemingly bland incident report. The master of a ship off the Russian port of Novorossiysk had discovered his GPS put him in the wrong spot – more than 32 kilometers inland, at Gelendzhik Airport. After checking the navigation equipment was working properly, the captain contacted other nearby ships. Their AIS traces – signals from the automatic identification system used to track vessels – placed them all at the same airport. Jamming of signals is easily detectable — and traceable. But spoofing is insidious because it cannot be detected; electronic equipment can appear to be operating normally, even though vessels are miles off-course. And while U.S. Navy ships use encrypted satellite-fed navigational signals rather than commercial GPS, that’s not to say those signals are impervious to cyber-tampering.